IBSPoint.com is fully owned by Sami Al-Taher Information Technology Establishment, a Amman, Jordan based full IT consultancy and Internet business solutions provider. IBSPoint was created to cater for an ever growing demand from the local Jordanian as well as pan Arab and Middle Eastern markets for Internet services solutions provider that fully understands the Internet as a technology and a true business tool to help these companies realize the full potential from their online presence. At IBSPoint we pride ourselves at providing a complete solution for our customers following our IBSPoint 360 solution methodology as outlined below, making us a unique solution provider for internet services in the whole of the Middle East. Our philosophy is to provide unique value to our customers by providing them with a full 360 degrees solution for their IT and Internet needs. 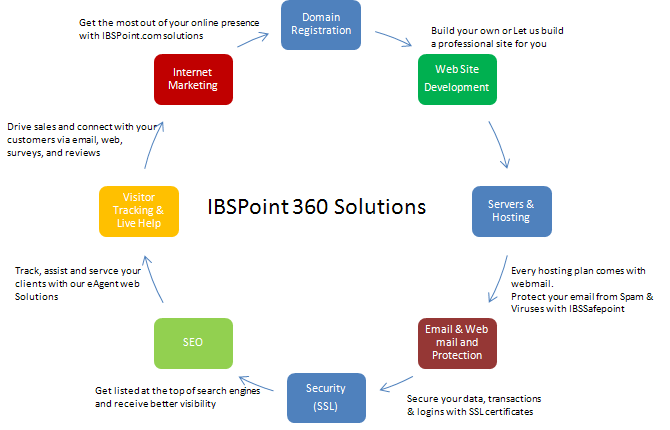 The diagram below shows the various solution categories offered by IBSPoint.com and how each component of the 360 degree IBSPoint circle closely connects the other components around it in order to complete the solution. IBShostarabia.com is an IBSPoint company that specializes in domain name registration services. A fully qualified registrar with the full range of domain services and offering registrations, renewals and transfers for the most popular top level domain extensions such as .com, net, org and may others. unlike most of our competitors, Each domains comes with unique value and a number of completely free services. For full details, visit our domains section. All of our shared hosting plans have access to our web site builder software from their hosting control panel. A simple and powerful web based web design software, which allow customers to choose from a huge library of over 700 templates and create their own web site in a matter of minutes or hours. Both types of sites are available either as a template based site, where the customer chooses a template from our professional library, and controls the various aspects of look and feel, pictures and content. Alternatively, for a truly unique site design, we offer complete custom designs to suit our customers every need. All of our web site development is strictly in adherence with industry standards, and fully SEO ready to enable our customers to quickly start their SEO optimization and improve their traffic ranking and visibility of all popular search engines. At IBSPoint, we provide our customers with a wide range of hosting services to suit their needs. Starting from budget hosting on our shared servers, to our unique Virtual Dedicated Servers, IBSVDS, and up to our enterprise and reseller level managed dedicated Servers, IBSRack. All our hosting solutions are available on Linux and/or FreeBSD as well as on the Windows operating systems. Every hosting plan for a shared, VDS or dedicated server includes access to one of our web mail systems allowing our users the full freedom to access their emails anytime anywhere. At IBSPoint, we realize the serious issues posed by increasing spam and virus attacks on email networks world wide, and therefore proudly present our IBSSafePoint email protection solution. With SafePoint, we help eliminate up to 98% of spam and viruses before they reach the corporate network. IBSPoint.com; is an Authorized Partner of GlobalSign, the SSL provider who secures 1000s of prominent websites worldwide. GlobalSign is a WebTrust accredited Certification Authority (CA) with over 10 years experience, and together we offer you a range of publicly trusted and highly cost effective SSL Certificates. For more information on why you should choose GlobalSign for your SSL security, click here. We advise that SSL should be used to secure your web site transactions, logins, webmail and connections. We offer you the highest levels of security, confidence and trust in your web site and online brand. As a GlobalSign Authorized Partner we take pride in our security and the security of our customers. With our Software as a Service (SaaS) offerings, our clients have the ability to run state of the art latest Microsoft Exchange servers on our securely hosted platforms. IBSPoint is one of very few companies world wide to offer MS Exchange 2010 as a hosted solution. For business collaboration, we also provide MS Sharepoint 2007 or 2010 either as a standalone product or as an add on to exchange. Contact us for further details, and to help you plan your new web based IToffice implementation. Search engine optimization (SEO) is the process of improving the volume or quality of traffic to a web site from search engines. This will allow your site to have more visibility on the web and help grow your business. Let our team of expert search engine optimizers help you get the most out of your web traffic. IBSAgent is the Next Generation Live Help and Live Support System that connects you to your website visitors. Use IBSAgent to provide Live Chats and monitor your website visitors in real-time. Convert visitors to customers – with IBSAgent! As a member of the RatePoint Business Partner program, IBSPoint provides its clients with customer feedback, product reviews, email marketing and survey tools, and dispute resolution capabilities. Using RatePoint, IBSPoint can easily help its clients proactively manage their online reputation through every customer interaction by capturing customer feedback and testimonials and displaying them in multiple areas, including Web sites, emails and marketing materials. IBSPoint MyAd is an innovative and simple internet advertising server alternative. The solution allows our customers to utilize advertising space on their web sites, and run advertising campaigns without the need for complex advertising servers, or the help of third party ad agencies. The customer decides on the space, cost for the ad and the system does the rest, while our customer have full control on their advertising decisions and revenue. Call us today to find out how you can make money by introducing ads on your site. Sami Al-Taher is a Jordanian national who was born and raised in Kuwait. He received his BSc and MSc from the University of Kent in the UK. He is versatile and self-motivated Senior Executive with 17 years experience in a wide range of corporate, business development and project management with cross-cultural experiences. Sami has been involved in setting up and managing Internet based and IT operations for over 14 years. Before setting up IBSPoint.com as a working brand of “Sami Al-Taher IT Est” he was the president and CEO of mecca.com, one of the largest social networks for the Muslims of the world. Before this he helped setup an IT consultancy service for the financial sector in the Middle East. Before that he was the CTO for Alturki Group, a major Saudi Arabian group of companies. Sami was a senior director and programs manager at Oneworld Software solutions a US based company with software development center in Jordan developing cutting-edge applications for world-class clients. In 1997 He started the first Internet based solutions provider, IBS, in Saudi Arabia. Sami has been a regular consultant for a number of portal, community and Internet businesses in the Middle East region. The Jordan Anti-Drugs Society chose IBSPoint for all their Internet Business needs including the design and development of their web site . FrequencySoft is a software development house based in Amman, Jordan with projects and operations in Saudi Arabia, UAE. With extensive expertise in Linux and Windows based development and a number of well known products especially in mobile and health applications. FrequencySoft relies on IBSPoint for their domain registration and web hosting services with more than 10 domains currently hosted. Found in 1991, Magic Herb started out as a very small family business composed of a man and his wife. The wife, who is a specialized herbalist, came about with several natural and effective formulas all with one goal in mind; to help others lead a healthier lifestyle by findingall-natural alternative solutions. They wanted to give people the opportunity to loose weight naturally and effectively; thus Magic Herb was created.